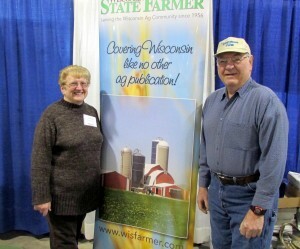 The WPS Farm Show may be over for this year, yet it is still on my mind. Those three days were a big change from our usual quiet life on Sunnybook Farm, and I couldn’t help but write about it. Ten days before the show, I started checking long range weather reports. I’d go from local reports to the Internet reports. Ten days out they are often different. I liked the one on the Internet the best because it kept telling me we’d have nice weather. I told myself that the others would catch up to this report as we got closer. No matter what report I checked, as we neared the first day for the event, they all started saying snow. Still it wasn’t supposed to be much for us, only an inch or two during the night. Surely, by morning the roads would be clear. I didn’t sleep well that night. I was sure I’d forget something important at home, like my purse, or Bob, or something. When morning came, I looked out the window and saw white—darn. Our road was white and slippery, but that was our road. I figured it had to be better when we got onto more traveled highways. Bob and I packed the car with my books and stuff. After tending to chores, we headed out on our 50 minute drive to Oshkosh. As expected, country roads were snow-covered and slippery. Still, the main road had to be better. Traffic would have taken care of it by this time. Right? My wishful thinking didn’t help the roads any. The state highways were as slippery as the country roads. Well, US 41 had to be better. Right? Nope. It was icy, even with all the trucks and cars on it. The only good thing about 41 was that it was so slippery everyone was going 35 mph. No one was speeding past the rest of us cautious drivers. It turned out to be a long drive to Oshkosh, but we made it without a problem. We were a bit late, but that couldn’t have been helped. At least we got there. The wind was cold and bitter walking from the car to Hanger C where Bill was set up in the Wisconsin State Farmer booth—Bill’s drive in from the south hadn’t been any better than our trek down. I guess we were all happy to arrive unscathed. The weather and slippery roads didn’t stop country people from coming to the show. Soon the aisles were swarming with people. It was so nice to talk to readers. Some came to shake our hands, others to visit, and others to tease. I expected to be visiting with women readers during the three-day show and I did. The thing is by count, I think most of the people who specifically came looking to meet me were men. I’d say maybe 90%, by my rough calculations. One man said his wife read my stories every week. He implied that he didn’t, that it was a woman’s thing. I then introduced him to Bob. Of course, he knew all about my husband—I think that man secretly reads my column on the side. We met and talked to people from all over the state. Of course, there were farmers from near Oshkosh, but others came from Janesville, Wausau, Racine, Oconomowoc, and from our neighborhood: Seymour, Black Creek, and Pulaski. Lucky for us, the road conditions improved that afternoon. Wednesday we started from home earlier and didn’t have any road issues. That day at the show was incredibly busy. I think everyone was watching the weather for the following day when rain was predicted. 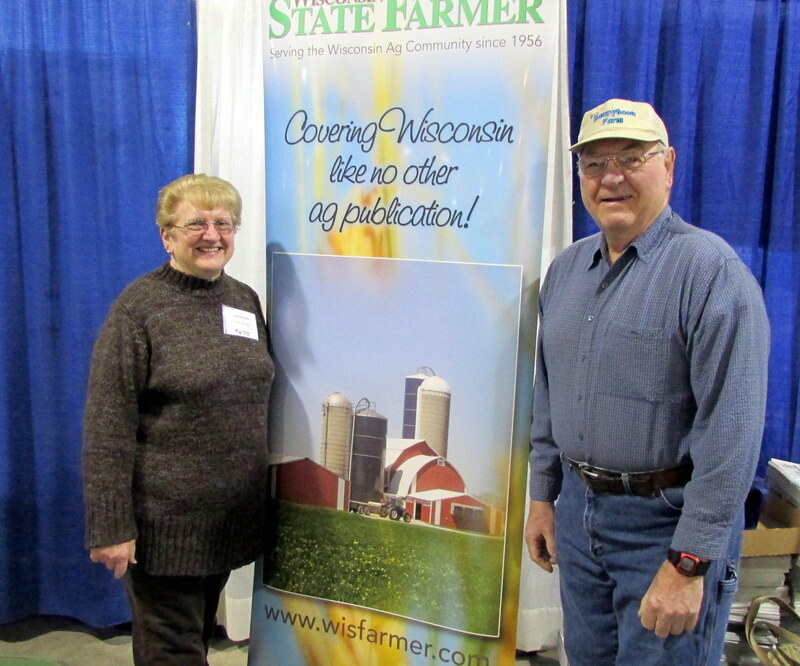 All three days it was cold and blustery, but that did not stop visitors from coming to the EAA grounds and visiting The Wisconsin State Farmer booth. Everyone was bundled up for the cold spring weather. Talk of the coming year and what to expect weather-wise were big topics at our booth. An old folk tale about the number of above 90 degree days equaling the number of winter days below zero was addressed. Every night, Bob and I came home very tired, but it was a good tired. We had spent our energy visiting with nice people. It took me an extra three days to feel my normal self again, but it was worth it and I can’t wait for our next outing. Wisconsin Farm Technology Days in Portage County is only a few months away, August 12-14, 2014. Hope to see you there.